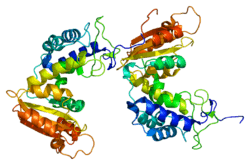 CD38 (cluster of differentiation 38), also known as cyclic ADP ribose hydrolase is a glycoprotein found on the surface of many immune cells (white blood cells), including CD4+, CD8+, B lymphocytes and natural killer cells. CD38 also functions in cell adhesion, signal transduction and calcium signaling. In humans, the CD38 protein is encoded by the CD38 gene which is located on chromosome 4. CD38 is a multifunctional ectoenzyme that catalyzes the synthesis and hydrolysis of cyclic ADP-ribose (cADPR) from NAD+ to ADP-ribose. These reaction products are essential for the regulation of intracellular Ca2+. The loss of CD38 function is associated with impaired immune responses, metabolic disturbances, and behavioral modifications including social amnesia possibly related to autism. The CD38 protein is a marker of cell activation. It has been connected to HIV infection, leukemias, myelomas, solid tumors, type II diabetes mellitus and bone metabolism, as well as some genetically determined conditions. CD38 produces an enzyme which regulates the release of oxytocin within the central nervous system. CD38 has been used as a target in treating multiple myeloma by using daratumumab. Initial results show encouraging efficacy in patients with heavily pretreated and refractory myeloma. CD38 has been used as a prognostic marker in leukemia. ↑ Orciani M, Trubiani O, Guarnieri S, Ferrero E, Di Primio R (October 2008). "CD38 is constitutively expressed in the nucleus of human hematopoietic cells". J. Cell. Biochem. 105 (3): 905–12. doi:10.1002/jcb.21887. PMID 18759251. ↑ "Entrez Gene: CD38 CD38 molecule". ↑ Jackson DG, Bell JI (April 1990). "Isolation of a cDNA encoding the human CD38 (T10) molecule, a cell surface glycoprotein with an unusual discontinuous pattern of expression during lymphocyte differentiation". J. Immunol. 144 (7): 2811–5. PMID 2319135. ↑ Nata K, Takamura T, Karasawa T, Kumagai T, Hashioka W, Tohgo A, Yonekura H, Takasawa S, Nakamura S, Okamoto H (February 1997). "Human gene encoding CD38 (ADP-ribosyl cyclase/cyclic ADP-ribose hydrolase): organization, nucleotide sequence and alternative splicing". Gene. 186 (2): 285–92. doi:10.1016/S0378-1119(96)00723-8. PMID 9074508. 1 2 Malavasi F, Deaglio S, Funaro A, Ferrero E, Horenstein AL, Ortolan E, Vaisitti T, Aydin S (July 2008). "Evolution and function of the ADP ribosyl cyclase/CD38 gene family in physiology and pathology". Physiol. Rev. 88 (3): 841–86. doi:10.1152/physrev.00035.2007. PMID 18626062. 1 2 Higashida H, Yokoyama S, Huang JJ, Liu L, Ma WJ, Akther S, Higashida C, Kikuchi M, Minabe Y, Munesue T (November 2012). "Social memory, amnesia, and autism: brain oxytocin secretion is regulated by NAD+ metabolites and single nucleotide polymorphisms of CD38". Neurochem. Int. 61 (6): 828–38. doi:10.1016/j.neuint.2012.01.030. PMID 22366648. ↑ Lokhorst, Henk M.; Plesner, Torben; Laubach, Jacob P.; Nahi, Hareth; Gimsing, Peter; Hansson, Markus; Minnema, Monique C.; Lassen, Ulrik; Krejcik, Jakub (2015-09-24). "Targeting CD38 with Daratumumab Monotherapy in Multiple Myeloma". The New England Journal of Medicine. 373 (13): 1207–1219. doi:10.1056/NEJMoa1506348. ISSN 1533-4406. PMID 26308596. ↑ Deaglio S, Mehta K, Malavasi F (2001). "Human CD38: a (r)evolutionary story of enzymes and receptors". Leuk. Res. 25 (1): 1–12. doi:10.1016/S0145-2126(00)00093-X. PMID 11137554. States DJ, Walseth TF, Lee HC (1993). "Similarities in amino acid sequences of Aplysia ADP-ribosyl cyclase and human lymphocyte antigen CD38". Trends Biochem. Sci. 17 (12): 495. doi:10.1016/0968-0004(92)90337-9. PMID 1471258. Malavasi F, Funaro A, Roggero S, et al. (1994). "Human CD38: a glycoprotein in search of a function". Immunol. Today. 15 (3): 95–7. doi:10.1016/0167-5699(94)90148-1. PMID 8172650. Guse AH (1999). "Cyclic ADP-ribose: a novel Ca2+-mobilising second messenger". Cell. Signal. 11 (5): 309–16. doi:10.1016/S0898-6568(99)00004-2. PMID 10376802. Funaro A, Malavasi F (1999). "Human CD38, a surface receptor, an enzyme, an adhesion molecule and not a simple marker". J. Biol. Regul. Homeost. Agents. 13 (1): 54–61. PMID 10432444. Mallone R, Perin PC (2006). "Anti-CD38 autoantibodies in type? diabetes". Diabetes Metab. Res. Rev. 22 (4): 284–94. doi:10.1002/dmrr.626. PMC 2763400 . PMID 16544364. Partidá-Sánchez S, Rivero-Nava L, Shi G, Lund FE (2007). "CD38: an ecto-enzyme at the crossroads of innate and adaptive immune responses". Adv. Exp. Med. Biol. Advances in Experimental Medicine and Biology. 590: 171–83. doi:10.1007/978-0-387-34814-8_12. ISBN 978-0-387-34813-1. PMID 17191385. Jackson DG, Bell JI (1990). "Isolation of a cDNA encoding the human CD38 (T10) molecule, a cell surface glycoprotein with an unusual discontinuous pattern of expression during lymphocyte differentiation". J. Immunol. 144 (7): 2811–5. PMID 2319135. Dianzani U, Bragardo M, Buonfiglio D, et al. (1995). "Modulation of CD4 lateral interaction with lymphocyte surface molecules induced by HIV-1 gp120". Eur. J. Immunol. 25 (5): 1306–11. doi:10.1002/eji.1830250526. PMID 7539755. Nakagawara K, Mori M, Takasawa S, et al. (1995). "Assignment of CD38, the gene encoding human leukocyte antigen CD38 (ADP-ribosyl cyclase/cyclic ADP-ribose hydrolase), to chromosome 4p15". Cytogenet. Cell Genet. 69 (1–2): 38–9. doi:10.1159/000133933. PMID 7835083. Tohgo A, Takasawa S, Noguchi N, et al. (1994). "Essential cysteine residues for cyclic ADP-ribose synthesis and hydrolysis by CD38". J. Biol. Chem. 269 (46): 28555–7. PMID 7961800. Takasawa S, Tohgo A, Noguchi N, et al. (1994). "Synthesis and hydrolysis of cyclic ADP-ribose by human leukocyte antigen CD38 and inhibition of the hydrolysis by ATP". J. Biol. Chem. 268 (35): 26052–4. PMID 8253715. Nata K, Takamura T, Karasawa T, et al. (1997). "Human gene encoding CD38 (ADP-ribosyl cyclase/cyclic ADP-ribose hydrolase): organization, nucleotide sequence and alternative splicing". Gene. 186 (2): 285–92. doi:10.1016/S0378-1119(96)00723-8. PMID 9074508. Feito MJ, Bragardo M, Buonfiglio D, et al. (1997). "gp 120s derived from four syncytium-inducing HIV-1 strains induce different patterns of CD4 association with lymphocyte surface molecules". Int. Immunol. 9 (8): 1141–7. doi:10.1093/intimm/9.8.1141. PMID 9263011. Ferrero E, Malavasi F (1997). "Human CD38, a leukocyte receptor and ectoenzyme, is a member of a novel eukaryotic gene family of nicotinamide adenine dinucleotide+-converting enzymes: extensive structural homology with the genes for murine bone marrow stromal cell antigen 1 and aplysian ADP-ribosyl cyclase". J. Immunol. 159 (8): 3858–65. PMID 9378973. Deaglio S, Morra M, Mallone R, et al. (1998). "Human CD38 (ADP-ribosyl cyclase) is a counter-receptor of CD31, an Ig superfamily member". J. Immunol. 160 (1): 395–402. PMID 9551996. Yagui K, Shimada F, Mimura M, et al. (1998). "A missense mutation in the CD38 gene, a novel factor for insulin secretion: association with Type II diabetes mellitus in Japanese subjects and evidence of abnormal function when expressed in vitro". Diabetologia. 41 (9): 1024–8. doi:10.1007/s001250051026. PMID 9754820.